Finally! Another jazz singer with chops and soul to sit alongside the mighty Kurt Elling. I am so excited about this artist. Originals, offbeat covers, a superb band and a voice both elastic and soulful.This record is effortless and bursting with class. A curiously modern record despite being traditional solo jazz piano. Vijay manages to say a great deal in short spaces of time, and has appeared to develop a soloing style that seems steeped in jazz history one minute and reinventing it the next. There are rough edges too and a lack of flashiness that contributes strongly to the strong emotional heart of this deeply, deeply satisfying record. A new jazz singer, recorded and accompanied beautifully by the UK's finest, singing mostly, esoteric originals. This eccentric record points a bold way forward for UK jazz singers. The Bad Plus proving that they are as catchy and compelling songwriters as the ones they have covered in the past that brought so many people into their music (like me!). This band has the power to bring people into the joys of improvised music with the ever growing body of brilliant work they are creating. Polar Bear continue to bring an aesthetic to jazz that no-one else does quite as well - and that is an atmosphere and vibe outside of the jazz club. The sound of this record reeks of a filthy rock and roll studio, it reeks of an attitude, it proudly becomes its own scene. Music can go a long way when it creates for you as a listener a sense of belonging to something, and they do that perfectly. A sturdy and superb trio record. Not reinventing the wheel by any means but I found myself coming back to this many times this year. A genuine legend, still making music that is as good, if not better than he has ever made. If you're a young horn player and are consistently told about the importance of developing your own sound, beyond technique, then listen to this CD. Uniquely spiritual jazz music. Hey, hope you enjoyed the two-part special with Dave Brubeck. Don’t forget you can hear part two again via the BBC iPlayer and the entire interview is available to download via Jamie’s podcasts. Jamie was sad to have to cut sections of the interview because we ran out of time in the show (they spoke for a long time) so asked us to post this clip of Dave Brubeck talking about his encounter with The Pope.. it really made him laugh.. It was such an honour to spend time with Dave Brubeck let alone interview him at the Newport Jazz Festival. There are a few figures in the world of jazz who are still around who pretty much created the music and Dave Brubeck is one of them. Such an important figure and a great, great guy. We went over to his hotel one morning while we were at the Newport Jazz Festival and we sat down with him at his hotel and the whole thing felt more like a conversation. It was so interesting to hear his stories of how he got started and his time in the war. He's just an extraordinary musician and he just comes over as a phenomenal man, a family man, a great sense of who he is but also who he is in his family as well. He's been married to his wife Iola for 67 years and what really transpired in the interview is a lot of that stuff people know him for, Take 5 and It's A Raggy Waltz and that whole Time Out album, he's been developing and creating his music for his entire career right up until the current day. He's writing ballets, he's writing entire masses for church. An incredibly interesting musician who's never stood still a day in his life. One of the things I love about Dave Brubeck's music that I've always tried to apply to my own music is to not sacrifice certain musical complexities in the music but also make it really listen-able for people who aren't necessarily that drawn to jazz. Dave Brubeck was really the first jazz musician to have a huge hit in the charts and that was with Take 5 and indeed the whole album Time Out was a huge, huge hit with people that had probably never really listened to jazz before and I just find that amazing because this is music that is technically very difficult to play but he makes it sound easy with its playfulness and sheer listen-ability. The two-part special we recorded with Dave Brubeck runs on the 30th November and the 7th December to coincide with his 90th birthday. 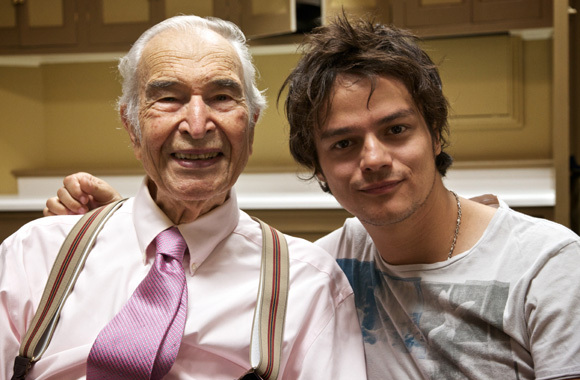 Jamie Cullum showcases his love for all types of jazz and music rooted in jazz, from its heritage to its future. You can stay up to date with Jamie Cullum via these feeds.